Over the years, documentation of Growing Innovation projects has burgeoned. So many rich conversations, so many new connections. Initially, Growing Innovation video documentation consisted of project documentation videos. We documented six projects that way to begin with (from Dawson Creek, Port Hardy, Salt Spring Island, Fort St. John, the West Kootenays and Lasqueti Island). Gradually it become apparent that themes across projects deserved their own documentary investigations, and so we came to produce thematic documentation videos, first on community, and then on innovation itself. More project video documentation ensued, from the Cariboo/Chilcotin and Gold Trail regions, as well as from the Kootenays and Haida Gwaii, then video documentation of Growing Innovation’s annual rural schools symposia, then came work on “Rural Teachers” video documentation on the ongoing encounter between innovation in formal education in rural settings and First Nations communities, and then on the singular West Kootenay Teacher Education Program. 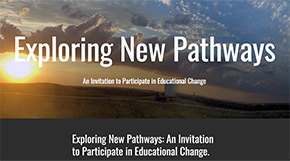 Along the way, anew feature, called “Voices of Rural Education” also emerged, to bring forward strong individual voices in innovation and leadership in rural educational change. Still, these were insufficient to the richness of the Growing Innovation archive of 300 interviews with teachers, students, parents, administrators, trustees and community members. 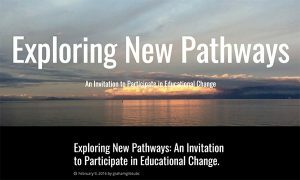 We found that a more sustained thematic form of inquiry and documentation was called for, one that follows particular courses of inquiry through all of the conversations…and the concept of New Pathways was born. Thematic inquiry documented in single videos can be overwhelming, whose very density can obscure the many trajectories contained therein. New Pathways allows for more sustained inquiries to take form, and more time to digest and discuss. The pilot was 2016’s New Pathway on engagement. This was followed in 2018 by a pathway on assessment, and then another on curriculum. To follow also will be New Pathways on collaboration, educational leadership, place and social justice. If, as Coulter et. al. (2008) argue, convening difficult conversations is educational leadership, Growing Innovation has staged enough for many lifetimes, from within the dreams and hopes of so many lives of exemplary rural educators, and also from those whose lives are touched, altered and changed by education as it changes, as it must – if it is to rise to the twin challenges of its pasts, and its futures. Growing Innovation documentation videos are used in teacher professional development, teacher education and educational research. 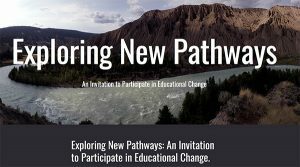 New Pathways series have also informed and inspired the form of curricula for early childhood educators confronting and assuming the challenges of reconciliation, both HERE and HERE. For information on all Growing Innovation Projects. For all Rural Teachers video documentation.